Posh striker Shaquile Coulthirst scores his first goal of the game against Leeds. Photo: Joe Dent/theposh.com. Obviously it’s all about peaking at the right time. A Peterborough United side who have struggled to score a goal, never mind beat non-league and under 21 teams, this summer, suddenly burst into life in the second-half at the ABAX Stadium today (July 23). Posh striker Shquile Coulthirst scores his second goal against Leeds. Photo: Joe Dent/theposh.com. In particular striker Shaquile Coulthirst, a player whose failuire to lift his head up and spot a better-placed team-mate has irritated in the past. That’s a fault that will be ignored if he keeps finding the back of the net from 25 yards as he did against Championship club Leeds United on two occasions this afternoon to turn a 1-0 interval deficit into a 2-1 win. Posh manager Grant McCann was still insisting after the game that fitness was more important than form or results, but he will be well aware this was a massive confidence boost for a team under concerted Twitter troll attack on social media in the last few week. Leeds looked pretty under-cooked as their first-half superiority was rendered irrelevant by a strong second-half Posh showing. The visitors’ early goal from Alex Mowatt turned out to be a mere consolation. There was more interest than normal in the announcement of the starting line-ups as McCann had promised to field the players who had impressed him the most in a lacklustre pre-season campaign. Andrew Hughes of Posh and Hadi Sacko of Leeds. Photo: Joe Dent/theposh.com. There were few shocks apart from the presence of Jack Baldwin, rather than Michael Bostwick, alongside Ryan Tafazolli in the centre of the defence. Seventeen year-old Leo da Silva Lopes would probably have started in midfield even if newboy Brad Inman hadn’t become the second broken leg victim of the season in a freak training accident the day before. Posh ‘keeper Ben Alnwick was called into action early when clawing away Luke Murphy’s goal-bound effort, but he was beaten on the quarter-hour when Mowatt turned in a low left-wing cross from Kemar Roofe. Marcus Antonsson came close to making it 2-0 after more good work from the lively Roofe before Marcus Maddison forced Rob Green into action twice in quick succesion. Coulthirst was busy without looking like scoring before the break, but he served notice on Leeds with an accurate shot on 38 minutes that Alex Purver cleared off the line. Alnwick saved well with his legs to thwart the impressive Hadi Sacko in first-half stoppage time before Coulthirst decided to steal all the headlines. On 49 minutes he delivered a stunning strike from 25 yards to drag Posh level and on 64 minutes he lt fly again from distance with enough power and accuracy to beat the former England ‘keeper in the Leeds goal. Maddison and Paul Taylor both came close to scoring before Sacko was twice denied by Alnwick. This was easily the most impressive Posh display of the summer, and all before a bumper pre-season crowd of 4,000, one swelled by almost 2,000 away fans. There will need to be some strong displays from those who didn’t start today - or a couple of marquee signings - to stop McCann naming the same 11 to face Rochdale on the opening day of the League One season (August 6). 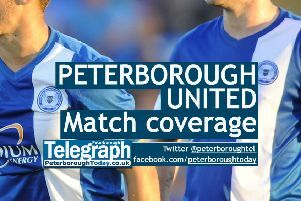 Posh: Alnwick, Smith, Hughes, Tafazolli, Baldwin, Da Silva Lopes (sub Chettle 77min), J. Anderson (sub Edwards 62min), Forrester, Coulthirst, P. Taylor (sub Nichols 85min), Maddison. Unused subs: Tyler, Bostwick, Freestone, White, Nabi, Stevens. Leeds: Green, Purver, Bamba, Bartley, Grimes, Murphy, Antonsson, Mowatt, Roofe (sub McKay 62min), Taylor, Sacko. Unused subs: Huffer, Taylor, Shackleton.